Four years ago today, I was sitting in a hospital bed looking at a MasterChef Australia magazine (or perhaps I was Facebooking on my husband’s iPhone 3G) while my brand new baby boy slept beside me. He was my fourth child. I thought throwing another child into the family would be disastrous, but as it turned out, a fourth child isn’t really much of a hassle. Well, not much more of a hassle than throwing in a third child was. By the time the fourth child comes along, he’ll pretty much raise himself! Just kidding. But if you have four children, I know you know what I mean. You noted everything with your first child. You probably even wrote it all down in one of those baby books. First smile, first roll, first food, first crawl, first everything. You never left her out of your sight, her clothes were always clean, you took pictures of everything she did, you recorded videos of everything she said. Then your second child comes along, and your third, and you realize you can’t remember when they first smiled, or what their first word was, or when they started walking. You don’t take as many photos or videos, everything’s not so perfect anymore and sometimes you just don’t care if all those kids just go to bed wearing the clothes they’re already in. Number four isn’t so bad. Things don’t really change that much. Especially when you realize that this one is actually the most cuddliest and the most cutest and the most cheekiest! Enter none other than Sweetapolita, the queen of gorgeous cakes and colorful sprinkles! 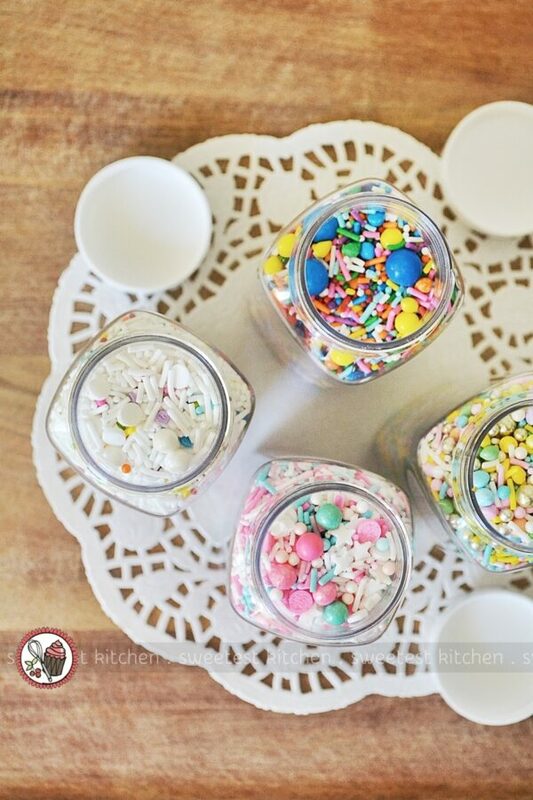 You totally knew that you could buy all those sprinkles she uses on her cakes, right? 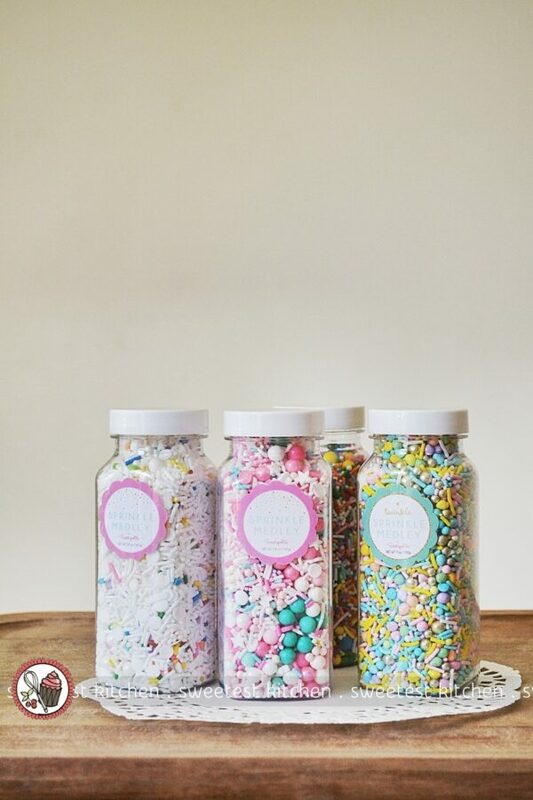 You can buy them right from her website and she mixes the sprinkles herself for her oh-so-cute sprinkle medleys. I organized a gigantic group order of those wonderful sprinkles to be delivered to myself and some local friends all the way over here in Australia. I was so relieved when they arrived the day before the big birthday! We spent over AU$540 on these sprinkles, and I can’t even begin to tell you how awesome it was to open that big box when it arrived! If you follow me on Instagram, you basically got to open the box along with me! For myself, I bought Jersey Shore, Pop Tart, Luxury Sweet and Circus. I used Circus for my son’s birthday cupcakes. And I have other plans coming up for the rest of the sprinkle medleys! But back to these cupcakes. I had to make some cupcakes really fast on my son’s birthday. We spent the day shopping for presents, then only had an hour and a half before we had to pick up the other kids from school. So, of course, there was only one recipe to make. My favorite wacky cake, but in cupcake form. This is the exact same recipe I used for that lovely little Happy Friday cake I posted last year. I claimed it was your “freedom from the box” cake, in that by using this recipe, you’ll find it as easy and as quick as using a box cake mix, so why not just snub your nose at those cake mixes and make your cake from scratch. I am completely serious. This is a one-bowl, no-egg, no-dairy, no-letting-things-come-to-room-temperature, no-stand-mixers, no-hand-mixers, nothing-fancy kinda cake. In the space of 5 minutes, you can have this cake in the oven and baking. I’m still completely serious. How long does it take to grab a mixing bowl, sift in flour, sugar, salt, baking soda and cocoa powder… then pour in some oil, vinegar, vanilla extract and water? Then just whisk it til it’s smooth, pour it into a cake pan and slide it in the oven. See?? That’s all there is to it. While that’s baking, you whip up some pretty simple frosting. You still don’t need a stand mixer, you still don’t need fancy ingredients, you still only use one bowl (well, except for the bowl you’ll need to melt the chocolate in). And I have got to tell you, this is the bestest, fudgiest, velvetiest, most luscious frosting on the face of the Earth (and perhaps even in the entire universe, should there be other bakers out there in the infinity of space). The recipe actually comes from Sweetapolita. When I saw this frosting recipe, I knew I had to use it on something. My son’s birthday chocolate cupcakes were the perfect excuse. This frosting is whizzed up in a food processor (don’t worry if you don’t have a food processor; you can make it in your stand mixer or with a hand mixer, instead) and consists of some butter, powdered sugar, cocoa powder, hot water, sour cream (next time I’ll use creme fraiche), vanilla, a good sprinkling of salt and melted dark chocolate. This whipped up like a dream in my Magimix. I couldn’t believe it when I opened the lid and saw this amazing frosting staring back up at me. It was truly love at first sight. To summarize, these cupcakes are freaking amazing. Make them for any type of celebration (your guests will rave about them), or even if you just need something super-chocolaty in your life (I guarantee these will hit the spot). 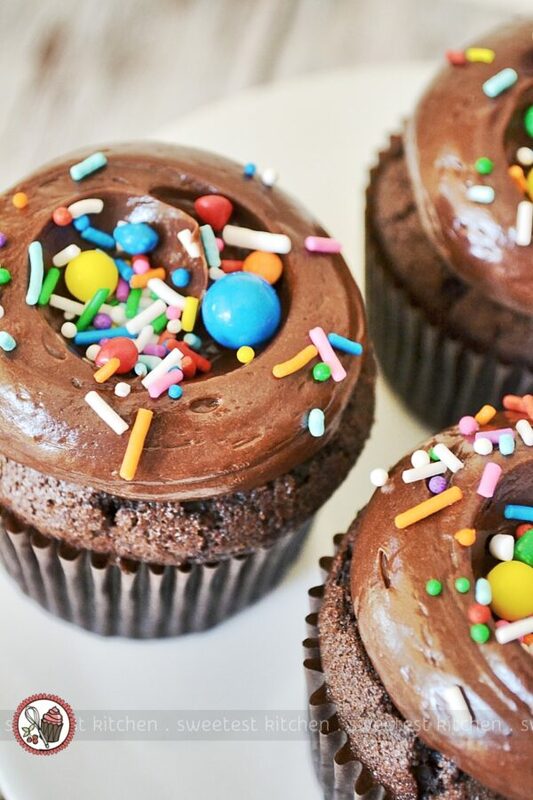 They’re the kind of cupcake you sneak up to your bedroom with and lock the door, pretending you’re getting ready for bed, and you slowly enjoy a tiny moment of peace and quiet with chocolate. Because chocolate understands, right? … This wacky cake recipe makes 11 cupcakes. It can easily be doubled. … The baking time mentioned below may be slightly less for you, depending on the type of cupcake pan you’re using. I normally use a metal pan, but I recently found a light pink silicone baking pan with straight sides (as opposed to the usual slanted sides) and I have wanted a straight-sided cupcake pan for about seven years!! I’ve noticed that cupcakes seem to take a little longer to bake in this pan. If you’re unsure, always always always err on the side of under-baked. 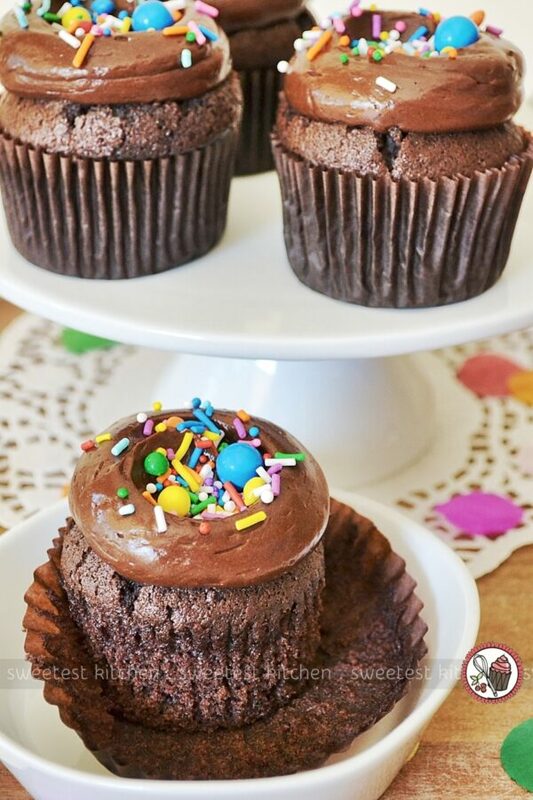 … These cupcakes produce a very rounded dome. If you’re not after the dome-shape, maybe this recipe isn’t for you. Or, you can do what I did on some of my cupcakes, and just slice off the tops of the domes with a sharp, serrated knife (cut gently and slowly in a sawing motion). 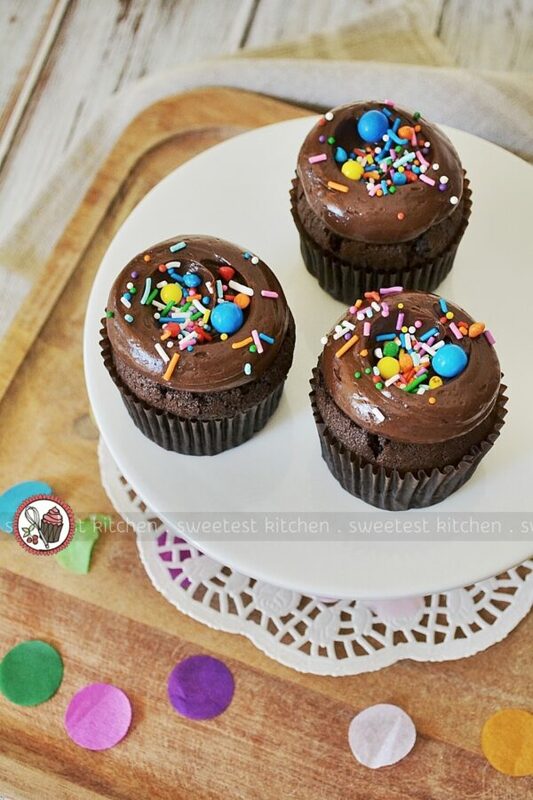 … You may think that the tops of the cupcakes are too hard or crunchy when you take them out of the oven. They will soften up, especially after you add frosting. 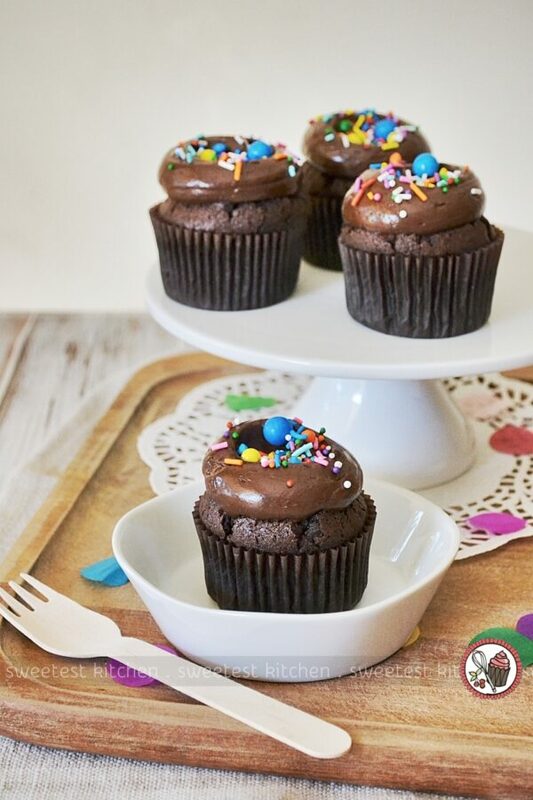 If it is a concern, nestle up those warm cupcakes (not straight-from-the-oven hot) into an airtight container and leave them for 30 minutes or a little longer; the moisture will soften them right up. … When you’re making the frosting… when you finish processing the ingredients without the melted chocolate, you may notice the frosting texture/consistency looks a little weird. Don’t freak out – just pour in your cooled, melted chocolate and process again. Ta-da! Perfect! … If your finished frosting is a bit too loose/runny to pipe or spread, pop it into the refrigerator for a bit to firm up. Stir every so often so you can keep an eye on the consistency; you don’t want it to get too firm, either. It’s a very smooth, spreadable frosting. As Rosie at Sweetapolita says, it has the perfect glide factor. Try to get it to this consistency before piping or spreading. Mine was perfect right out of the Magimix. 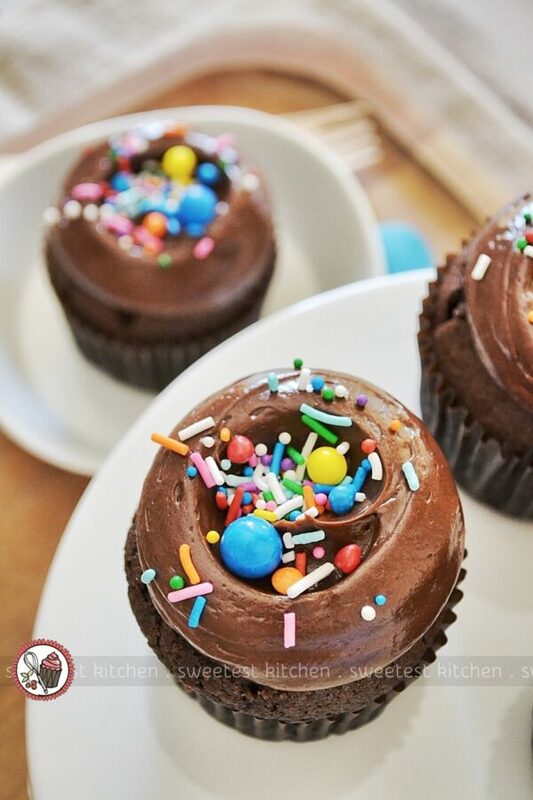 … The frosting recipe makes enough to generously frost 11 cupcakes, plus you’ll have heaps leftover. The leftovers will not quite frost another 11 cupcakes for a double batch; I’d estimate you’d be able to frost about 18 or 19 cupcakes in total with this frosting recipe, if you happen to be frosting them similarly to mine. … Rosie says the frosting will keep at room temperature for three days. I’m a bit more cautious, so I’m keeping mine in the refrigerator. They are great cold, although the frosting will be quite firm. Let them come back to room temperature if you prefer, when the frosting becomes softer. 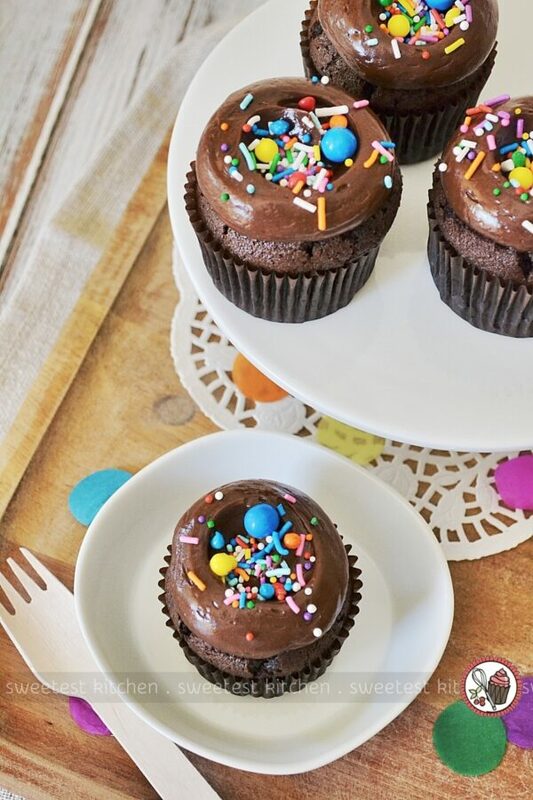 Fudgy, wacky cake-style chocolate cupcakes with luscious, velvety chocolate frosting and sprinkles. Super easy to make, no stand mixers required, completely egg-free and done in under an hour. Perfect for all types of celebrations or just simply for a really indulgent dessert! For the cupcakes: Preheat oven to 350F. 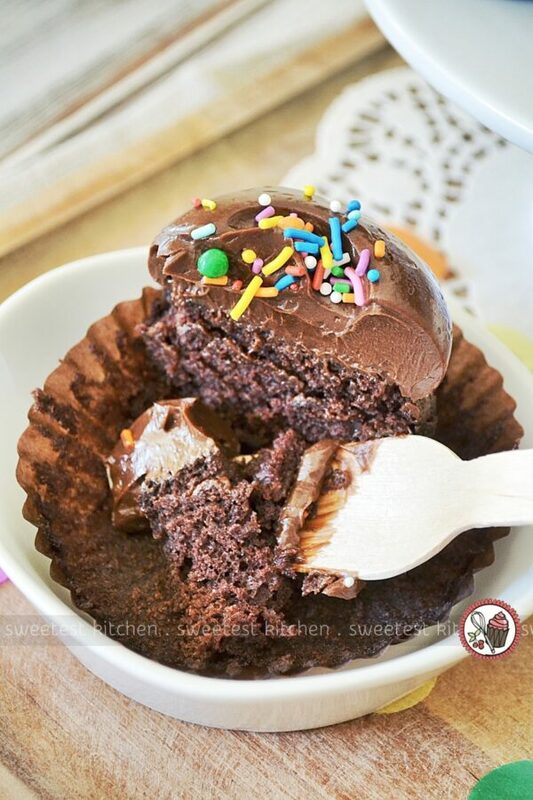 Line a 12-hole cupcake pan with paper liners (this recipe makes 11 cupcakes, so you can leave a hole empty!). Set aside. In a medium bowl, sift in flour, sugar, salt, baking soda and cocoa powder. Whisk to combine. Using a spoon, make 3 wells in the dry ingredients, one large well and two smaller wells. Pour the grapeseed oil into the largest well, the vinegar into one of the smaller wells, and the vanilla extract into the last well. Pour the cold water over everything and whisk the ingredients together until the mixture is smooth. The batter will be quite runny. 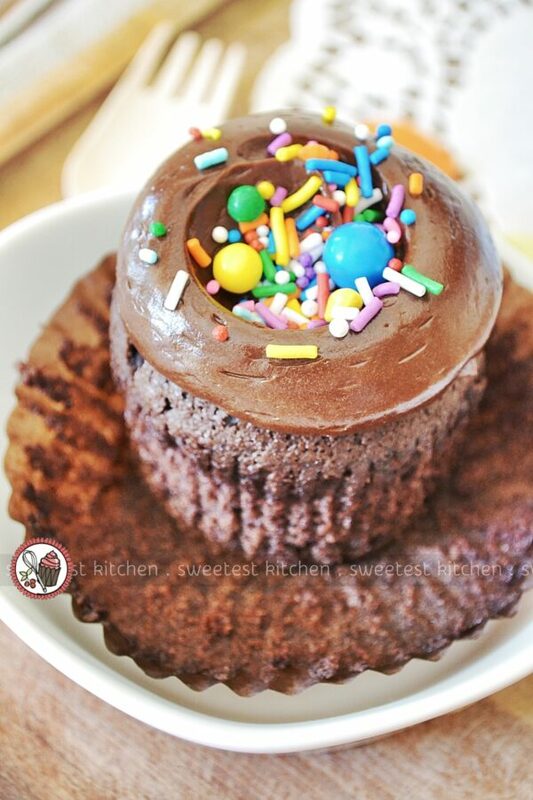 Fill cupcake liners ¾ full with batter. Bake for 15-20 minutes. They are done when the tops spring back when lightly pressed in the center (or you can do the toothpick test). Remove from the oven and cool in cupcake pan for a few minutes, then transfer to a wire rack to cool completely. For the frosting: While the cupcakes are baking, add butter, powdered sugar, cocoa powder, hot water, sour cream, vanilla and salt to the bowl of your food processor (see recipe notes if you don't have a food processor). Process until combined and no lumps of butter remain. Pour in the cooled, melted chocolate and process briefly to combine. If the frosting is too loose/runny to pipe or spread, place it in the refrigerator for 5 or 10 minutes and stir every once in a while to keep an eye on the consistency; don't let it get too firm. Transfer to a piping bag fitted with a large, round tip and pipe mounds of the frosting on the cupcakes. 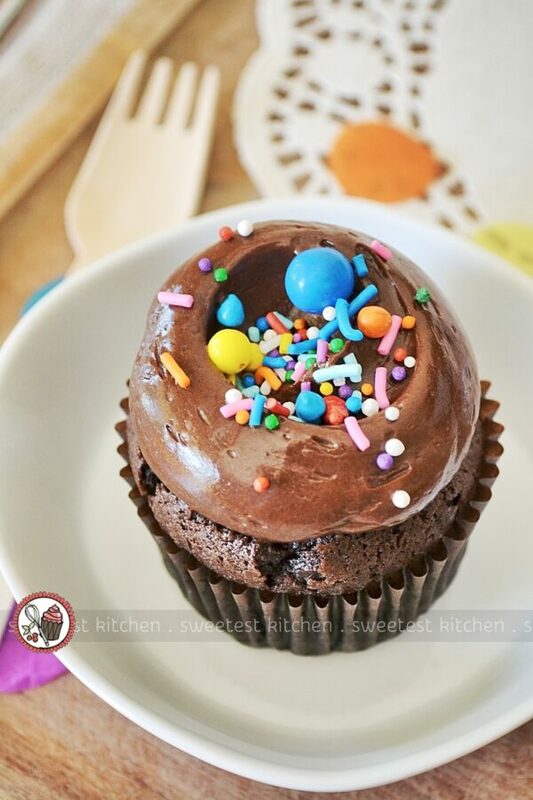 To get the little "sprinkle pond" in the middle, hold the cupcake in your non-dominant hand and a small spoon in your dominant hand. 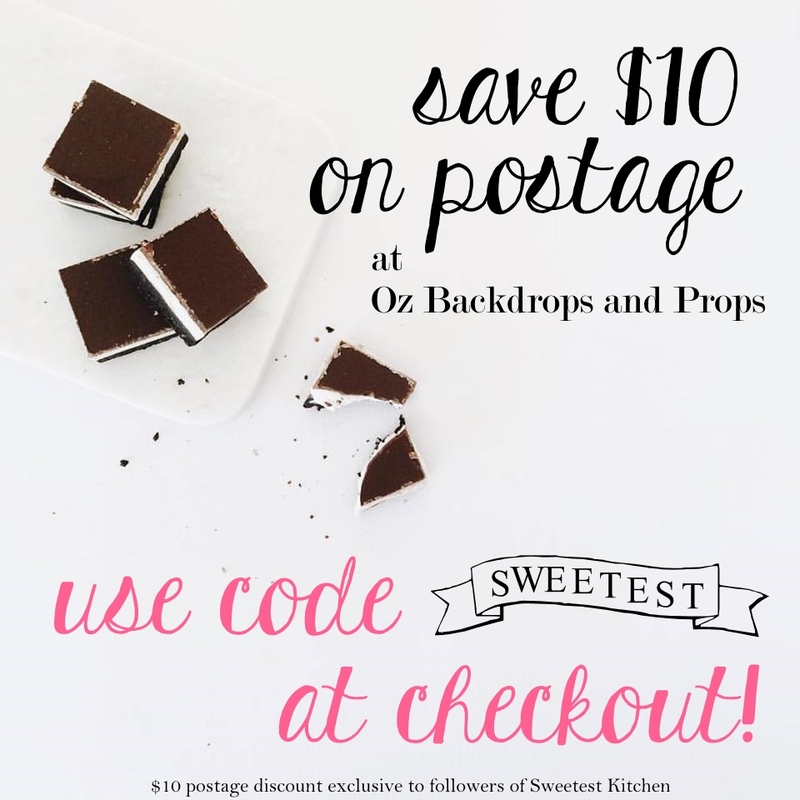 Press the back of the spoon into the middle of the frosting, and at the same time, twist the cupcake counter-clockwise while you twist the spoon clockwise. Hard to describe, but easy to do once you get the hang of it. You can also pipe swirls, or just simply spread the frosting on the cupcake! 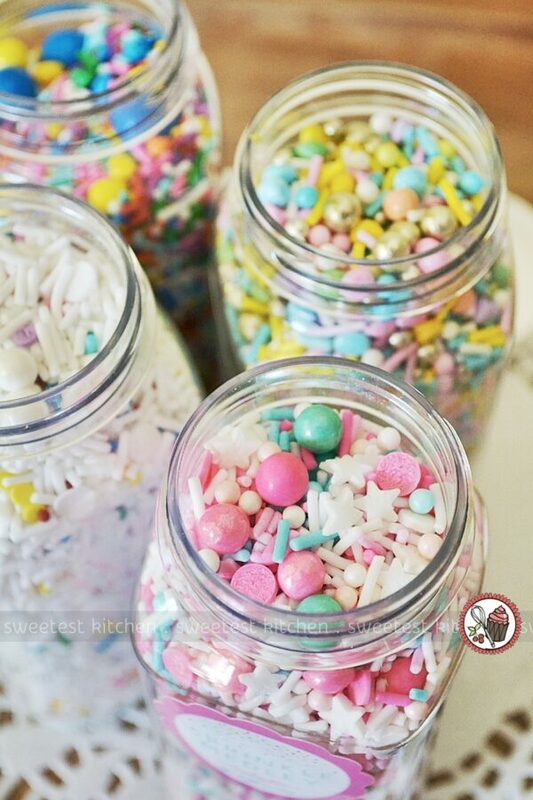 Decorate with sprinkles!!! If not serving straight away, don't add sprinkles just yet; the moisture in the refrigerator makes the sprinkles go soggy and causes the color to run. So let the cupcakes come to room temperature first so the frosting becomes soft, then add the sprinkles just before serving. Store in the refrigerator for 3 or 4 days. Frosting will firm up, but tastes great cold anyway. If you prefer, let the cupcakes come to room temperature and the frosting will soften up. See bottom of post above for more notes regarding this recipe. * I always use a scant cup of sugar, which means just a bit under a cup. * You can also use plain Greek yogurt instead of sour cream or creme fraiche. Use a good, high-quality cocoa powder for a great-tasting chocolatey cake and frosting. I always use my favorite cocoa powder - Van Houten. If you don't have a food processor: In the bowl of your stand mixer fitted with the paddle attachment, or with a handheld mixer, beat the butter on medium speed until pale and fluffy, about 6 minutes. Sift together the powdered sugar and cocoa powder. Reduce speed to low and add the sugar/cocoa mixture, water, sour cream, vanilla and salt and beat until incorporated, about 1 minute. Increase the speed to medium and beat for 2 more minutes. Add the melted chocolate and beat on medium speed until smooth, about 1 minute.